Since setting out as an independent contractor, I’ve been noticing a lot of personal growth. Emotional and spiritual growth, certainly, but the one that’s got me concerned is the physical growth. My most recent travels seem to have expanded my horizons, starting at my diameter. I’ve tried to find the time and energy to get back to working out. And it’s just not working. I’m too tired. I’m too disinterested. But I’m a problem-solver and this is a web 2.0 world. So I’m outsourcing my personal fitness. To me. I’m going to pay myself to do my workouts. If I work out, I get a reward. If I continue to work out, I’ll get more rewards. The goal is to incent myself to keep going, without making it too discouraging if I take a break for a month for injury or travel or other reasons. The other goal is to make it okay to spend money on things that aren’t completely functional, so I’m just going to take the existing amount I spend on books and movies and such and use that as my funding budget. Second, I need to fund this. So I’ll take my average monthly spending on toys and treats like books and movies and such, and divide by four to get the weekly spend, which is 100%,. Now I just have to figure out how to break up the 100% among the goals. And I have no idea how to do that so I’m just going to build something called a Straw Model. 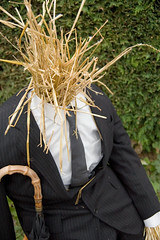 The Politically Correct term “Straw Model” evolved from “Straw Man” which dates back to a time when people would make human-shaped figures out of straw as training targets for weapons training. A straw man wasn’t as good as a live opponent, but it was a great place to start. The Straw Model is conceptual, another creative tool for dealing with the unknown, a place to start. I want to build a financial model for paying myself, but I don’t know what the right answer is. So I just make up a model and pick some numbers and then test it a little to see how it works out. So take my monthly spend divided by four and that’s what I spend in a week, call that 100%. Each time I hit a goal, I pay out according to the table. Great. Done. That’s the straw model. Now to test it. If I work out and log one day, I get 5% At the end of a week, that adds up to 25% Plus another 25% for doing a complete week. Though I start the program without the sustain bonus because it’s the first week. But wait. . If I miss one day’s workout, I lose 23% of my week’s incentives. And I lose 50% in sustain bonus. And I lose 50% in sustain the next week because this week wasn’t complete. So one day’s screw up costs me 123% of my whole week of “pay.” So one day’s lapse undoes over a week of a achievement. That’s a little harsh. so let me try a different balance. Now if I miss a day’s workout, I lose 28% for the week again. And 30% for two weeks. Now my penalty is 78%. That’s better, but it’s still saying that one day undoes about a week’s good work. Which still feels unbalanced. And that’s okay. This is still the straw model, and I’m adjusting the shape of it as I go. Right now there’s a big hit for the first missed day, whereas a second missed day in the week would be only 10% more pain. So I continue refining. This time, I think I need to put the emphasis on the daily work, and make the weekly bonuses smaller. Now if I miss a day’s workout, I lose 30% on the week. With the two week 10% impact to my sustain bonus, that’s a total of 50% hit for a day of slacking. That’s still a big hit, but not so big that it’s discouraging. And now I have a model that I like. It turns out that my initial assumption, that the bonuses were key, was wrong. This revised model looks like it’ll actually help motivate me to do my workout. The Straw Model is a very useful tool for dealing with a lack of knowledge. The key is to accept that you don’t know and make guesses. As good a guess as you can make, but if you can’t make a good guess, then make a bad one. Refine the model and return to testing. Enjoy the awe that people will feel as you tame the unknown and unknowable. The Straw Model is almost silly, but it is one of the best tools in my consulting toolset. The fact is there are lots of times you have to proceed with incomplete information. And this is a way to do that. Tagged with budget, creativity, data, design, fitness, life, modelling, problem-solving, productivity, tools. You made my brain hurt… Seriously, you realize you could have conceptualized all this stuff WHILE taking a walk or working out, right? I could have. Also, most of the model design happened in my head in the course of figuring out what my goals were. But “I’m paying myself to workout” is not a blog post, and teaching about Straw Models is. Why don’t you just let me nag you into exercising. This made my brain hurt, too. But it’s not that hard to make my brain hurt. This post also reminded me of this show the kid turned on the other night called “Deadliest Warrior.” They had human shaped figures they used as practice targets. I kind of wish they’d used Straw Men, instead, because the fake blood was grossing me out. I should try a rewards system! And I think you’re last model is a good balance, because missing one day does take a big toll out of your overall fitness. It’s amazing how quickly your stamina can unravel.